When it comes right down to it, a Company's fortune will rise and fall based on its ability to grow its business and earn profits. Historical Earnings Growth is important. Has the Company been profitable in running its business? Is it maximizing its potential? How does it stack up to its competitors? These are all important questions. And the Research Wizard can answer them all – thru Screening and Backtesting. Projected Growth Rates are just as important – if not more so. How a Company has done is good to know. But how a company is forecast to do is critical. Since the stock market is forward looking, a weak outlook will likely be met with lower prices. Historical Growth Rates notwithstanding, lower future earnings usually means lower stock prices. But a strong outlook shows the Company is on the right track. And a robust projected growth rate will likely be rewarded with higher prices. Note: this pre-defined item cannot be backtested. However, you can create a Projected Growth Rate item that CAN be backtested. This can be done with the Calculation Expression feature. F(1) Earnings Estimate minus the F(0) Actual Earnings (or the Consensus if the Actual is not yet reported) divided by the absolute of either the Actual F(0) or the F(0) Consensus. The definition box above the Categories and Items windows shows the formula when the item is highlighted (as illustrated below). In the Calculation Expression feature, we'll create a custom item that can be backtested. The only real difference will be that; instead of using the F(0) Consensus Estimate if the F(0) Actual is not available, it'll use the previous period's Actual Earnings. In this example: let's create a screening item that looks for stocks with greater than a 30% Projected EPS Growth Rate. 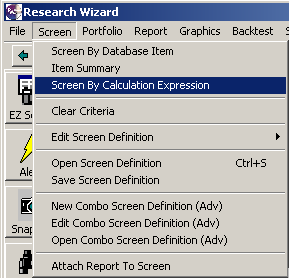 or click on the Screen By Calculation Expression button on the Toolbar. The Calculation Expression window will then pop up. 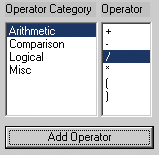 2) In the Operator Category window in the bottom left corner, select Arithmetic, then select the opening parentheses in the Operator window and then click the Add Operator button. An opening parentheses will be added to the long dialogue box above the Categories window as shown below. 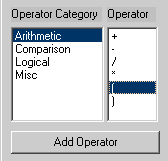 4) Then let's go back to the Operator Category window in the bottom left corner and select Arithmetic, then the minus sign in the Operator window and then click the Add Operator button. 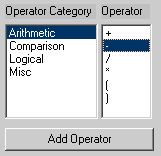 6) Then let's go back to the Operator Category window and select Arithmetic, then the close parentheses in the Operator window and then click the Add Operator button. The expression should now look like this. 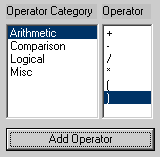 7) Go back to the Operator Category window, select Arithmetic, then the division ' / ' sign and then click the Add Operator button.
' < - Select ' button under the Function Parameters section. And then click the Add Selected Function button (under the Function Category window) to add this to your expression. 10) If it does, click the OK button at the bottom of the Calculation Expression window. 11) The Screen By window will then pop up. 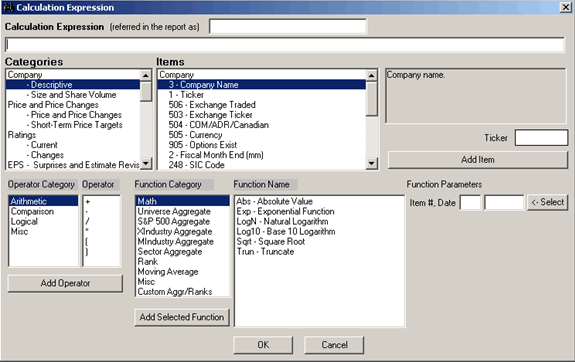 Select the 'greater than' operator, i.e., ' > ' and then type in 30 (for 30%) to define the value. (In this example, we're screening for projected growth rates of greater than 30%.) Click OK, and the Calculation is complete. This item is now ready to be backtested. Or you can add to this screen as you normally would to further narrow it down with other criteria. Be sure to save your screen so you can access it again. If this is an item you expect to use over and over again in other screens, you can save the above calculation as a single item screen to add to other screens any time you want to add this item again. You might want to create a special folder in your Inputs Folder for your custom items. For example: let's create a Folder called Custom Items. 2) Once your Screen Definition window pops up, select the Create New Folder icon. 3) A 'New Folder' folder will appear as shown below. 5) Click the Save button and this screen will now be saved in the Custom Items folder. Here's the Cool Tip part. If you want to access this item so you can add it to another screen you're building, you can. And now you want to add the Projected Year over Year Growth item that you created in the Calculation Expression feature so you can backtest it – but you don't want to have to recreate it again the Calculation Expression feature. 1) Go to Screen on your Menu Bar and select Open Screen Definition. 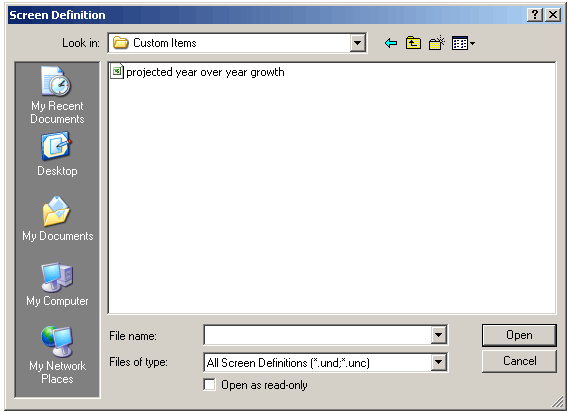 2) Then select the Projected Year over Year Growth screen and click Open. 3) A Window will then pop up asking if you want to Clear the Screen Definition. Click NO! By clicking No, we're not replacing our current Screen with the newly selected screen, but instead, we're adding this screen (in this case our custom item) to the screen we've been working on. Once you select No, another window will pop up and ask you if you want to clear the report definition. You can answer either Yes or No. If Yes, the current report will be replaced with the report that is associated with the Projected Year over Year Growth screen. If you select No, the current report will remain in place. Neither choice will have any impact on the Screen. For this example, let's say Yes. Projected Year over Year Growth, i.e., (i49 - i31 ) / Abs(i31) *100 added to your screen. You'll see it also replaced your report if you clicked Yes to the Clear Report window. Either add the other items back in, or add one of your favorite custom reports to your finished screen. And if you want to then backtest this new screen, be sure to give it a name and save it and you're ready to go. Start using the Projected Year over Year Growth item in your own screens and see how it can make a difference in your strategies. I've experimented with this item quite a bit and have found that if you go too high, it diminishes your returns. But that's for another article. Until then, test out different projected growth rates and see how they perform for you.